Curious if the water at Oak Spring is accessible to a hiker or if it is fenced off. Would appreciate photos, if anyone can post them, of the spring area up close. It’s fenced. The water tank, pump station and piping/valves are inside the fence. I might have a photo somewhere. The last memory me and the misses have of the spring, there was water running on the ground that could be pumped. Are you looking to pump spring water? I am considering the prospects of picking up some spring water from Oak Creek whether pumped or scooped or filled from a nice convenient tap. So are you saying there is some spill over from the spring that flows out of the fenced in area? Below the mechanical stuff, in the creek bed, we saw water and a bunch of cattails. There was a trail from the road heading down to the wet stuff. Cookie and I discussed it again, and it may have been 8 - 10 years ago. Ahhh, Big Bend Time. The park may be sucking that spring down so deep now that the water no longer hits the surface. Sorry, not very good info for planning a hike. If it ain't running, I would think anyone driving by would gladly give you some at the Sam Nail Ranch. Water flow at Oak Spring is highly variable for 150gpm to less than 5gpm. 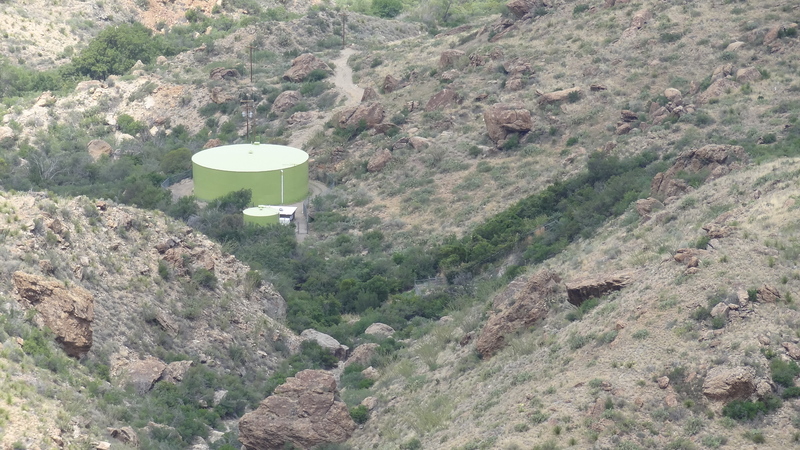 Like most water sources in the Big Bend, it comes from a small aquifer in the talus slope on the west slope of Vernon Bailey Peak. Low flow rate during drought periods is insufficient for any overflow from the spring catchment box and all the water is ducked up and pumped into the Basin. The NPS advises hikers to not rely on springs. The opinion expressed above is my own and not that of the National Park Service or the Federal government. Thanks for the replies. I'm just checking the feasibility of an optional water source for a potential ramble late this fall. Croton Spring is "the other way"? If you do have any photos, that would be great! Realized last night that I had my own picture of Oak Spring and the Tanks from my July trip! So this is looking down from the overlook on the Oak Spring Trail high above the Window Pouroff. The green spot in the center is the general spring area of which part is enclosed in fencing.